Pleasant arrival, nice staff and clean beds. It is a fine hostel reasonably close to the centre. The beds are comfy but a bit squeeky. The dorms in the basement are nicely dark, cool and quit. triendly and helpful staff. 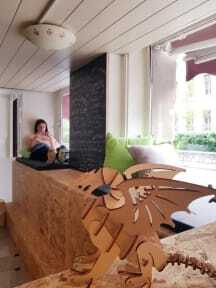 Nice hostel, close to city center. Great people! Bad hostel experience. No common atmosphere. Rooms without any daylight in their basement. Dirty showers. Can find better in Ljubljana for sure.